NOTE: This post is going to be a bit on a longer side, but it’s important. I want to encourage you to please take the time to read it all. Thanks! When Noah was born over 7 years ago, we had a negative experience with our OB/GYN. As we’ve interacted with families of children with Down syndrome we realized that a lot of them seemed to have had a negative experience with their child’s Down syndrome diagnosis. In addition, we learned that a mother’s womb is the most dangerous place in the world for a child with Down syndrome, as over 60% of them never make it out alive. To further complicate things, most medical professionals do not receive adequate training in medical school on how to deliver a Down syndrome diagnosis, nor do they have a personal relationship with anyone with Down syndrome. So you have medical professionals that aren’t properly trained on how to deliver this news, and don’t know anyone with Down syndrome, yet, they are tasked with giving a parent the life-changing news that the baby in the womb likely has Down syndrome. Over five and a half years ago my wife and I were sitting in bed talking about a way we could help families whose child was just diagnosed with Down syndrome receive encouragement and hope (and ultimately help more children with Down syndrome make it out of their mother’s womb alive.) On top of that, we wanted to find a way to help educate medical professionals and help them develop a relationship with someone raising a child with Down syndrome. We came up with a rough plan and a name (Hope Story.) I bought HopeStory.org, and we went to sleep. Shortly after buying that domain I went to work for a large non-profit where I stayed for over 5 years, all while Hope Story sat on the shelf. One of our goals is to connect every OB/GYN in America to a family raising a child with Down syndrome. We call these families Hope Advocates, and we think they could change the world. Please take a few minutes to watch the short video below. This will give you an idea of the sort of impact a Hope Advocate can make. We hope to duplicate what you see in this video all across the United States. In short, Hope Story will be developing, producing, and distributing world-class resources to the medical community. We believe the best resource is another parent who is a little further down the road. We call these parents Hope Advocates. 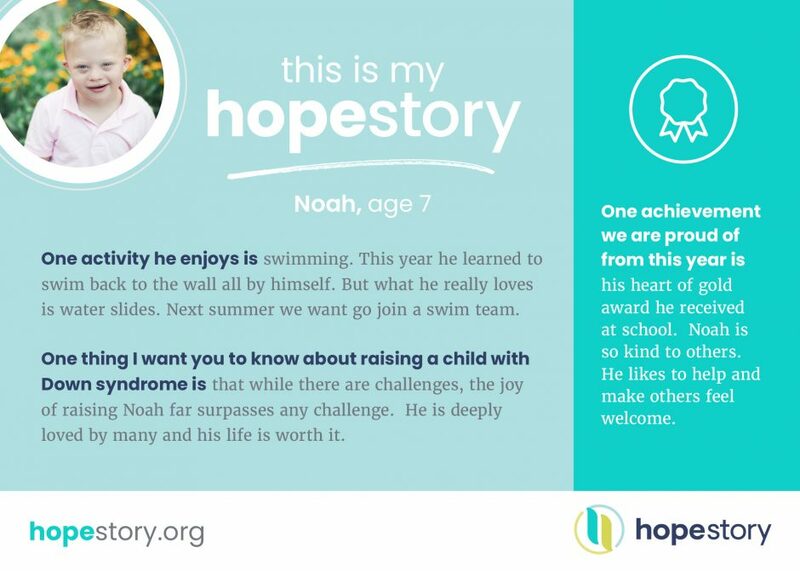 We will train, resource, and help connect these Hope Advocates to opportunities to share their story with people who need to hear it the most (families whose child has just received a Down syndrome diagnosis.) In addition, we have a medical advisory board that will help ensure the accuracy and excellence of our resources. Take a few minutes to check out the video below, which explains the process in more detail. We send out Hope Advocates a personalized Hope Kit packed with resources including customized cards (Hope Announcements) they give to their medical professional, along with Hope Advocate business cards their medical professional can give to their patients. Here’s an example of the Hope Annoucments. Check out the Hope Kit contents here! There are lots of ways for you to help us bring hope to others! I hope you’ll jump in on all of them! 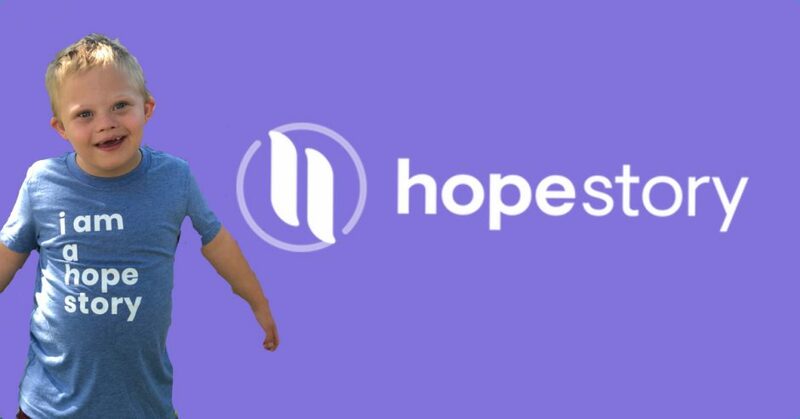 🙂 If you have any questions about Hope Story, or how you can partner with us, please send me a message. We’re really excited about what’s in store. If you are a parent of a child with Down syndrome, become a Hope Advocate! As of today, we have over 1,000 people who are interested in becoming Hope Advocates. Simply read through the information on this page and enter your email address on the form at the bottom of the page. 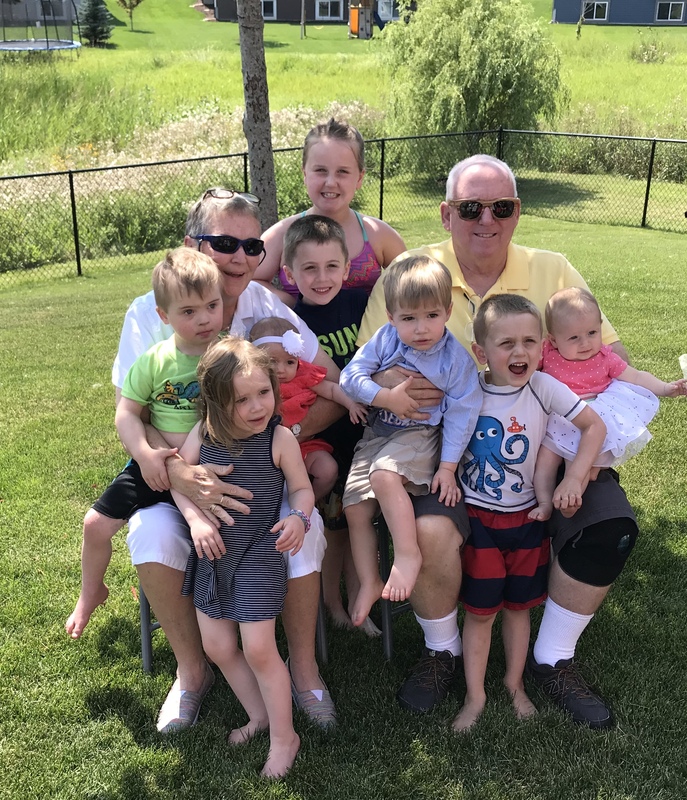 If you live in Texas, Delaware, Iowa, Idaho, Indiana, Montana, Nebraska, South Dakota, Vermont, Wyoming, or Louisiana, would you skip one Starbucks drink a week (2.50) to help Hope Story save the lives of babies with Down syndrome? If every person who is subscribed to this blog would simply donate 10 dollars a month, that could go a long way! As you can imagine it takes financial resources to do what we want to do, and we really need your help. You can click here to set up a reoccurring donation. Hope Story is a Texas nonprofit corporation. Our application for 501c3 status is currently pending before the IRS, and 100% of your donation will be used to help us bring Hope to Others. Visit the Hope Story Facebook page and share the cinematic trailer that’s pinned to the top of our page to your wall and encourage your friends to check out Hope Story! If you are a part of a local Down syndrome organization, drop us a line. We’d like to talk to you about how Hope Story can potentially help your organization connect with more parents in your community. If you’re a parent of a child with Down syndrome your and your child are a story of hope to someone else! We encourage you to grab an “I Am A Hope Story” shirt from our online store. Share your story with us! We may even feature it on the Hope Story blog. Follow Hope Story on Instagram, Twitter, and Facebook. Sign up for email updates from Hope Story by clicking here. What do you think about what we’re working on and our plan to connect every OB/GYN in the United States to a family raising a child with Dosyndromeome? Interested in becoming a Hope Advocate, or in supporting Hope Story with a financial donation? Leave us a comment and let us know! I have followed your story since Noah was born, you are both amazing parents not only to Noah but to your other two little boys. I have 5Grandsons none of them has Downs but one of my beautiful boys has Tourette’s and he is on the Autism Spectrum he is 13 years old and like Noah he is such a beautiful and very loved boy. I pray for your family and may God bless what you are doing to help these children be accepted so much more into our communities. Thank you for the kind words! It’s all by God’s grace. May I ask what state you are from? I am from Victoria Australia Rick. I have followed you and your family since my grandson was born with DS almost 5 years ago. You and you family are amazing and such role models for all of us. I admire what you are doing for all families that have or will be given that news. It really doesn’t have to be scary but we do need to educate people about DS to lessen the fear of raising a child with DS. Thank you again, you have a beautiful family. Thanks for the kind words, and for following along! It looks like you have a great crew! Thanks for sharing the picture. May I ask what state you are from? Such a great initiative! Wishing you guys all the best. Hopefully one day Hope Story can spread its love and positivity all over the world. Thank you! May I ask what state you’re located in? 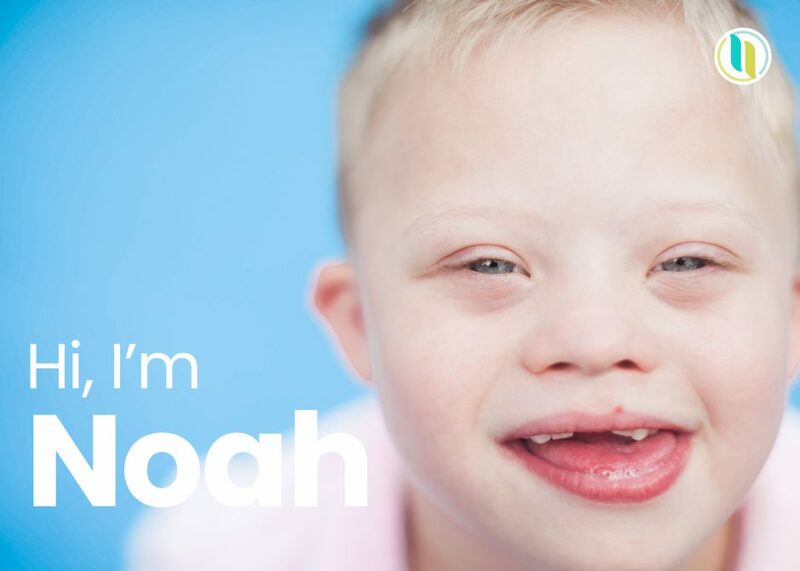 I’ve been following Noah’s story for about 6 years now and I’ve learned a lot about Down Syndrome thru his story. I am so happy that you are finally able to do this. You and your family are so loving and caring and I know this will help a lot of people. Good luck and Congratulations!!! You need any help, let me know and I’ll do the best that I can to help you all out. Thanks for the kind words, and for following along. What state are you located in? I live in Northern New Jersey. I love the intention of Hope Story, but am turned off by the description of a mother’s womb being “the most dangerous place” for any child. While there are many instances where medical professionals recommend terminating pregnancies when Down syndrome is discovered, it is the medical professional and their uneducated advice that is harmful, not the mother’s womb. I’m hoping you’ll reconsider how you’re approaching this issue so that the act of carrying and birthing a child with Down syndrome is not seen as a negative or harmful occurrence. Congratulations on putting up The Hope Story. It will definitely foster a more open and honest relationship and communication between the doctor ( OB-GYN ) and the parents with a Down Syndrome baby. I had a sister with DS who died 4 years ago at 46. I have 2 nephews with Down Syndrome and definitely, like Noah, they bring lots of joy to our family despite lots of challenges in taking care of them. This sounds wonderful! I’ll never forget how you are told about our daughter’s diagnosis. She’s ten years old now, and just a life-force of our home.